Howdy! Times are a changing and soon Autumn will be here. 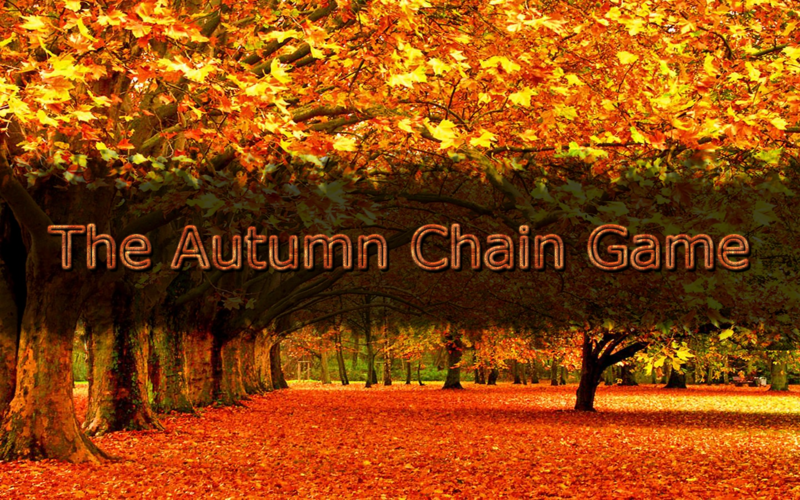 What better way to celebrate than to get some people together and make a big ol' chain game? This jam thing is for Unity3D users, and if you're not used to Unity feel free to use pre-made assets and tools as necessary. To do this jam, create a scene in Unity3D, package it as an Asset Pack, then upload it for use in the chain-game! - Uploaded file needs to be an asset package file exported from Unity3D, including your scene as well as all of the assets being used in the game (so that way the scene will actually load properly with all of the parts it needs). - The scene must have Autumn as a theme, you can try Holidays like Halloween or Thanksgiving out, or just make a world entirely out of dead leaves, but it MUST have Autumn as it's central theme. - Your scene can have any form of player control/mechanic as you please, but it does have to have some form of conclusion so the main compilation game can progress to the next creator's scene. If you make a scene that can be considered virtually endless (no goal/free roam), just add a way for the level to end (like placing a door sprite down somewhere or adding a clickable button). Don't worry about actually managing these scene transitions, I'll take care of that for you if you tell me at what point the scene should change in your level. How DARE you go against the rules in such a bold stroke! Pfffrghg,, I'm tearing my hat over this! How dare YOU go against the southern hemisphere. Hey, do you think it matters which version I use? I think I have three different Unity installs and none of them are the current version for important reasons~ Like the most recent might be a whole .x number behind, if that makes sense. For this chaingame, the entire thing is compiled in Unity 2017, but you can use older versions as long as they're from the Unity 5 series and up. To prevent issues, it would be best if people would use Unity 2017, but if that's not possible try to use the most recent copy you have. this is a reminder to myself that i want to do this. If you do participate, I'm looking forward to what you make! i had a hard time coming up with stuff but i wanted to include something so here this is. maybe use the text as a collision to go to the next scene? Hey, doesn't seem to include a scene in it. Looks like it's just a material, a texture, and an FPS controller. I think something may have gone wrong in export. yeah, i didn't include the scene :( oops! Okay, here's my asset pack! Okay, here's my asset pack! I hope it works, I used a terrain generation plugin that might not export right. Please let me know! Awesome Marek! Thanks for the pack, I'll see if it imports properly. Actually, I just tested it and it would appear that it only came with a scene and is missing prefabs/materials/textures. Wow, just gave that a look and it's incredibly atmospheric! Great work! Thanks for all the extensions! The ending is triggered in GameManager.cs > handleEndingCue (replace the Debug.LogError at line 40). Awesome! Thanks for the submission!